With simple linear regression, you look for a certain type of relationship between two quantitative (numerical) variables (like high-school GPA and college GPA.) This special relationship is a linear relationship — one whose pairs of data resemble a straight line. 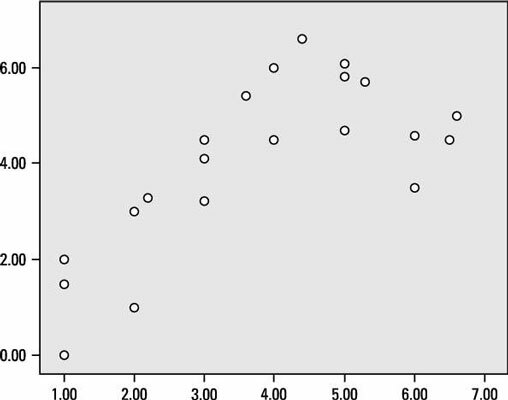 In this scatter plot, the two variables plotted are quantitative (numerical). The correlation is r = 0.75. In looking at this scatter plot, which of the following violations of a necessary condition for fitting a regression line is observed? A. The variables aren’t numeric. B. Their correlation isn’t strong enough. C. Their relationship isn’t linear. Answer: C. Their relationship isn’t linear. The variables are numeric, and a correlation of 0.75 is sufficient to perform linear regression. However, the relationship of the points in the scatter plot isn’t linear. The points initially have a positive relationship but then curve downward into a negative relationship. The equation for calculating the least-squares regression line is y = mx + b. If two variables have a negative relationship, which letter is guaranteed to be negative? The slope of the equation is m. If two variables have a negative relationship, they will have a negative slope.